Methods used in inducible transcription factor studies focus on MRNA (B. Ziokowska, R. Przewocki). Neuroanatomical and functional mapping using activation of transcription factors (M. Dragunow, D. Bilkey). Studies of the DNA binding activity of transcription factors in mapping brain function (B. Kaminska). Immediate early gene (IEG) expression mapping of vocal communication areas in the avian brain (C.V. Mello). Molecular activity maps of sensory function (A.Chaudhuri, S. Zangenehpour). Immediate-early gene expression in the analysis of circadian rhythms and sleep (B. Rusak, M.E. Guido, K. Semba). The expression of C-FOS in the spinal cord. Mapping of nociceptive pathways (H. Bester, S.P. Hunt). C-FOS in learning: beyond the mapping of neuronal activity (L. Kaczmarek). 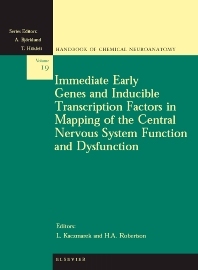 Mapping neuropathology with inducible and constitutive transcription factors (A. Pearson, M. Dragunow). C-JUN, JNK and P38: visualization of neuronal stress responses (T. Herdegen, S. Brecht). ELK-1: an important regulator of immediate early gene expression in the brain (P. Vanhoutte, J. Caboche). The EGR transcription factors and their utility in mapping brain functioning (J. Leah, P.A. Wilce). Creb plasticity and memory (S.A. Josselyn, S. Kida, P. de Ortiz, A.J. Silva). Subject index.